Divine Mercy in My Soul. 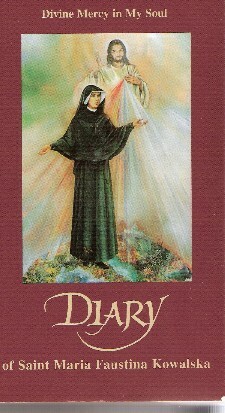 The Diary is a dramatic telling of St. Maria Faustina Kowalska's amazing encounter with The Divine Mercy - our Lord Jesus Christ. On Mercy Sunday 2006, Pope Benedict XVI said, "The mystery of the merciful love of God was the center of the pontificate of my venerable predecessor [Pope John Paul II] - evidencing that the devotion to Divine Mercy is not a secondary, but an integral dimension of a Christian's faith and prayer." The Diary chronicles God's invitation to turn to His mercy as a source of hope for the world. In it, we are reminded to trust in the Divine Mercy of Jesus and seek His forgiveness. And as Christ is merciful, so, too, are we instructed to be merciful to others. The message of Divine Mercy has become an integral part of Catholic faith, including the celebration of the Feast of Divine Mercy on the Sunday after Easter as Jesus had requested of St. Faustina. The Diary is truly a book that inspires people to turn with trust to Jesus and guides the reader through an intimate journey of prayer and devotion that ultimately leads to God's mercy.